And so begins the weekly installment I call, Lost in the Library, wherein overlooked treasures hidden away in the CFL collection are unearthed for all to see. Our first installment focuses on Gary Yanker's fascinating study of political posters, Prop Art, published in 1972 with an introduction by NBC news anchor John Chancellor. Yanker is first and foremost a collector of posters, a passion he explains as originating from his lack of funds for more conventional, and pricey, works of art. Both left and right wing propaganda posters are represented in an effort to show balance and free the presentation from endorsing any ideological belief system. The most striking observation I came away with as I read through this twenty-five year old collection, a study of then current propaganda, is the amount of artistic effort and creativity present in the presentation. The posters depicted were ephemeral, serving a cause often completed or lost soon thereafter. Whereas propaganda in the form of posters once served as a viable form of communication for spreading ideas, the internet and television have now supplanted poster, and print in general, as the most widely available sources for propaganda. There is something almost quaint in the amount of faith the poster makers seemed to place in the messages on display. Yanker's analysis of political poster design begins with the renaissance for the medium during the Chinese Cultural Revolution and the 1968 Paris student riots. He also discloses the popularity of posters as a propaganda tool - low cost, freedom from censorship, and the ability to implant ideas. Yanker also looks at how political posters are created with particular audiences in mind. Posters can be emotional or rational in their appeal, abstract or representational in their artistic approach. The author's lack of judgment regarding the political merits of messages represented in the propaganda posters he so loves is a refreshing break from the often opinionated positions of those presenting the ideas and imagery of far left or right groups. Prop Art is certainly no longer a contemporary study of political posters as was meant when published, but it does present a beautiful collection of images filled with creativity, artistic merit, and conviction. In celebration of the vast world of blogging and those who bring you these often brilliant sites highlighting both the mundane and the extraordinary, I bring you Blogging The Universe, a weekly installment including both description and points of connection. These are blogs I find to be of interest, either for the aesthetics of the site, sensational prose, or some combination thereof. Suggestions are always welcome. I'm a sucker for anything Japanese so Jeremy Hedley's Antipixel blog has fascinated me since I discovered it a few months ago. He compiles beautiful photography and print imagery from Japan courtesy of his residence there as a tech worker. His photography, usually capturing local scenery and objects, is amazingly beautiful, something he also adds to in words as he describes his take on the images. He also has an interest in local art, especially art used to advertise products. The appeal of what was once a disposable wrapper or gift card (see the image above) in Japan certainly highlights the often overlooked beauty of print advertising across time. Enjoy! George Lamplugh "The Book That Changed My Life"
History teacher Dr. George Lamplugh shares his experience with a book that profoundly impacted him. 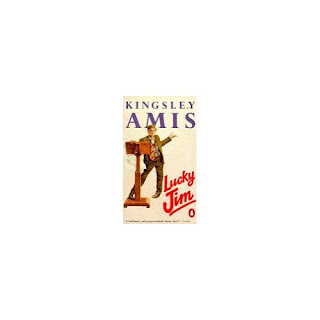 "Many years ago, in grad school, I was reading the preface to a book about Kentucky politics after the American Revolution and noted that the author had good things to say about Kingsley Amis's Lucky Jim, a novel set in a backwater college in England after World War II. Amis follows the stumbling academic career--and love life-- of the title character, a historian who has very little good to say about either college teaching or historical research. I was so taken by the description of the novel that I found a copy, read it--and laughed myself silly. Then I put it down and forgot about it until I had been at Westminster for a few years. At that time, the politics of this place were pretty brutal, and each year brought a series of bizarre events. Trying to navigate these conflicts and crises proved very stressful. One summer, anticipating with dread the crazy events the new school year would no doubt have in store for me, I picked up Lucky Jim and re-read it. Once again, I could hardly stop laughing; then it occurred to me that, having experienced in Amis's fictional academic setting a place that made Westminster seem almost "normal" by comparison, I might now be better prepared to return to work in the Fall. And I was! Pleased with the results of this literary therapy, I made it a practice over the next decade or so to re-read Amis towards the end of every summer. It never failed to prepare me to cope with the new school year!" Roy Lovell "The Book That Changed My Life"
When I was a senior in high school, I was taking physics from a nice gentleman-chemistry major-who had earlier taught me a solid chemistry course. Pressed into service as a physics teacher, and being therefore out of his area of expertise regarding "subject matter knowledge," he was soldiering on, teaching a course that was fairly shallow, uninspired and tentative. Nevertheless, I was intrigued by physics. Before there was internet commerce, there were (and in some places, still are) used bookstores-places where, for the price of one new book, one could walk away with an entire armful of "finds." It was in such a place I found a little paperback that had been published in 1946. The title page identified the author as a "professor of theoretical physics" (whatever that was) named George Gamow. The book was called One, Two, Three…Infinity. This book opened up a whole new world for me, heretofore undreamed of-the world of advanced mathematical and scientific reasoning. In this book, I encountered for the first time, expressed in lively, lucid prose, numerous mathematical and scientific ideas that have continued, ever since, to puzzle, amaze, and challenge me: Cantor’s transfinite arithmetic, Euler’s imaginary numbers, "pure" vs. "applied" mathematics, number theory, "geometry without measure" (i.e., topology), "curved space," "four-dimensional distance," relativity of spacetime, presocratic atomism, subatomic particles other than protons, neutrons and electrons, Heisenberg’s Uncertainty Principle, Bohr’s Complementarity Principle, quantum superposition, matter waves, positive electrons (i.e., antimatter), cosmic ray showers, nuclear fission and fusion, "atom smashers," entropy, absolute zero, statistical fluctuations, the "riddle of life," the galaxy of stars, the universe of galaxies, stellar evolution, the expanding universe, and the cosmic singularity, to name a few. I asked my physics teacher to explain some of these topics to me, but he only shrugged and said he didn’t know about any of that. At that time I resolved to learn about these things, and I am still doing so. Along the way I acquired a passion for the work of passing on the profundities of math and physics to the next generation. I am still doing that too. The book is yet in print from Dover Publications, though the enclosed photo depicts the original cover." Maggie Davis "The Book That Changed My Life"
Art Department Chair Maggie Davis shares several books. "There are three books that had a lasting impact on my life. Two revolve around water, one released the writer within. The Phantom Deer, author escapes me. I was about 10 when I checked it out of the Sayville Public Library on eastern Long Island, my refuge from home. I checked it out because there was a hand colored photograph of the Seven Mile Bridge in the Florida Keys. The bridge spans seven miles over the most beautiful azure blue water I had ever seen. The story was captivating, about a young boy who finds an orphaned Key deer and raises it then releases it. The word images of the Florida Keys captured my imagination. I thought they must be the most perfect place on earth and it set up a longing to go there one day. Which of course I did, long after the book had been returned and I had grown up. Hemingway's The Old Man and the Sea. I was in my 20's when I read it. Having grown up on Great South Bay and the north Atlantic, spending time with my father fishing on the rock jetties on Fire Island, Hemingway's description of the struggle of this fisherman rang true for me as a young person. The story recognized the power of nature and the fragility of life, something that has been a life theme in my work as an artist. Writing Down the Bones by Natalie Goldberg (just celebrated 20th anniversary of the publication of this book). I collect books about writing but never thought I was a writer until I read Nate's book. Read it cover to cover on a flight from Miami to New York City. When I got off the plane I knew I wanted to be a writer. I took the book with me to the Metropolitan Museum and followed her writing practice while sitting in the Temple of Dendur. I spent the day writing in different rooms of the msuseum, stopping only when my stomach was growling loud enough to be noticed by passers-by. That book led me to study with Natalie in New Mexico on a sabbatical 2004-05. I started a writing group using her technique. We self-published a small volume of stories and poetry called " Evenings at Lily's". Lily was my white standard poodle who listened patiently to all the many stories that unfolded in my living room that winter and spring. And then there is A Death in Venice by Thomas Mann; The Time it Takes Falling Bodies to Light by William Irwin Thompson and many more "change my life books", books that kept me breathing when I didn't really want to. To this day I still look forward to bedtime when I can curl up with plump pilows, soft light and the "I can't wait to get back to that book" on my night stand (currently The Prince of the Marshes, Rory Stewart which I will donate to the library when I am finished)."